The only language 13-yearold Manewa speaks is Telugu. Having studied only till the fourth standard, she helps support her family by working as a domestic help in a nondescript village in the Nizamabad district of Andhra Pradesh. Sitting up in her bed this morning at the Apollo Health City, Hyderabad, a demure smile spreads on her lips as she talks to the friendly nurses â€“ the 38 mm hole in her heart was closed the previous day through a painless medical intervention. In another room of the same hospital, three-month-old Jyothi cries out loud. She does not know any other language. That would be the last thought on her mother Parothamma's mind though, as she stands perfectly still for a triumphant photograph with her precious one in her arms. This infant weighing three kilos had a six mm hole in her heart - very big for one so small. This hole, medically called a Patent Duct Arteriosus (PDA), was causing too much blood flow to her small lungs, making the lungs all wet and susceptible to pneumonia. If left untreated for even close to an year, the baby could become inoperable. "The good news is that such cases are easily treatable if brought in at the right time," says Dr. S.R. Anil, senior consultant at the department of pediatric cardiology, "but the bad news is that not many people are aware of that." It is estimated that over 2,00,000 children are born with heart diseases every year but less than 5% of them get optimal care on time. Most of these children succumb to the disease with out celebrating even their first birthday. Had they received treatment on time, they could have grow up to become normal adults. If untreated, Manewa ran the risk of developing heart failure by the time she was legally old to get married. The kind of hole she had, between the left and right atria (upper chambers) of her heart, is called an Atrial Septal Defect (ASD) through which blood would flow into her lungs. As she ages, the lung pressure would become higher because of this blood flow, and her skin would slowly turn blue. Thankfully, she didn't need to undergo an open heart surgery to get that hole closed; there was minimum intervention in the procedure followed. Dr. Anil and his team pushed a bio compatible material (something like a rolled up band aid, if a crude comparison can be used) through a vein from her leg (all veins end in the heart) to the gaping 38 mm hole. Considering that the tube carrying this was just 4 mm, it was a precocious journey to the centre of life. To add to the sweat beads, they could not see this directly; they had to go by what an inserted small camera called Transesophageal probe would show on the monitor. Once the rolled up band aid was pushed out of that 38 mm hole, it expanded to 40 mm â€“ just enough to cover the ASD. An inflated balloon kept across the hole helped to seat it in place. Manewa didn't know of the odyssey happening inside her beating heart, of course â€“ she was on anesthesia. She would have to have Aspirin tablets for six months though, during which blood would clot over this band aid and an endothelial tissue would grow over it, and the hole would fade to be just a memory. "We have been doing many such complicated interventions on younger and younger children every day," shrugs Dr. Anil, "but not many are aware of it." One such patient was just five days old. Another thing many are not aware of, is the organisation called Save A Child's Heart (SACH), perhaps the largest charitable organization in India providing pediatric cardiac care to children in the lower socio-economic groups. 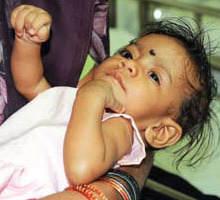 The medical intervention in three-month-old Jyothi would have cost around Rs. One lakh, something that Parothamma and her auto rickshaw driver husband would not have been able to afford. That is where SACH comes in: in Andhra Pradesh the cost of such a surgery is borne by a SACH, Apollo Hospitals and the government. In other states, SACH and Apollo Hospitals help foot the bill as local governments are yet to commit on contributing. The approach to Save A Child's Heart is five pronged: prevention, detection, treatment, funding and follow up care. Screening camps with state-of-the-art equipment are organised across the nation and identified cases are then transported to Apollo for treatment. Founded by the Apollo Hospitals Group chairman Dr. Prathap C. Reddy in 2003, SACH has touched the lives of over 50,000 children so far. 1) Donate online: Visit sachi.org.in. All donations are exempt from income tax under section 80G. As the song goes, "Once more you open the doorâ€¦ and my heart will go on and on." 2)Sponsor a child: SACHI has many children awaiting treatment. You can support the treatment cost of one child or more, either partially or fully. You can also follow up on the treatment personally, or ask SACHI to keep you intimated on the child's progress. You can be assured that you will receive much more than you can ever give. 3)Volunteer: Have workable ideas for camps, counseling or events that can touch lives? SACH would welcome you with open arms. 4)Join: SACHI invites medical social workers, trained nutritionists, individuals and organisations to join their efforts.